If you’ve decided that it’s time for you to focus on more nutritious eating, there’s a very important stage that you mustn’t miss out on. And it’s understanding how to cook and store your newly improved food items safely, because there’s no point trying to eat better if you don’t take care of the health and safety aspects of your diet. When you go to the shops, plan your shopping list so that you do all the non-food shopping before the food purchases because food left in a car while you shop for other items is more likely to develop bacterial contamination. When you are doing your food shop, pick up perishable and high risk goods just before you head for the check-out as this again minimises the time that foods like fish and poultry are spending at room temperature and keeps ice-creams and other frozen items cold for longer. If you live a long way from the shops, buy an insulated chest or bag to carry your meat and frozen items home in. One of the easiest ways to get bacteria onto meat is to handle it. So unless the store packaging is damaged, refrigerate and freeze meats, poultry and fish in their original packets. Check whether tinned meat and poultry items should be refrigerated – if not, store them in a cool dry place. In your fridge, put cooked meats like salami on a shelf above raw meats: raw meat juices dripping onto processed meat have been implicated in several food poisoning outbreaks in the past. Freezer burn can be seen as whitened, dried areas on the surface of meat or vegetables. It is generally harmless, although it damages both the taste and texture of the area that has been ‘burnt’. It happens because air was trapped in the packaging when the contents were frozen, and oxygenation has caused the food to desiccate. To avoid this, put items in tinfoil when you freeze them, or use plastic bags or freezer-safe plastic boxes from which the air has been expelled. Don’t eat freezer-burnt vegetables that you have thawed and not cooked (for instance sweet corn or peas) because there is a small risk of botulism forming on the surface of certain vegetables - it can be killed by boiling. When you take meat, fish or poultry from the freezer to eat, it’s best to thaw it slowly and at a low temperature because bacteria can multiply rapidly at room temperature. This is generally achieved by leaving it overnight on a plate in the fridge. The plate is necessary to catch any drips that could contaminate other food in the freezer. It will be ready for use the next day. If you must thaw food faster, and it’s not recommended, you can set it in a watertight bag under cold water – change the water every half hour, it should defrost in about three hours. You can also use your microwave to thaw food safely if you follow the manufacturer’s guidelines. None of these rules apply to whole chicken or other poultry which should be thawed for 48 hours in a refrigerator. It’s best not to leave leftover food to cool at room temperature. Where possible, put the remains of your meal straight into the fridge. To cool food more quickly, separate it into smaller portions as this will cool more quickly. The whole idea of swift cooling is to get the food to a temperature where bacteria cease to multiply, so if you have a large amount of food to cool, put it in a cool bag or ice-chest, because it runs the risk of raising the temperature of the fridge as a whole and putting your entire food supply at risk. Ensure you, and anybody else in your kitchen, wash your hands and tie back long hair before touching food. 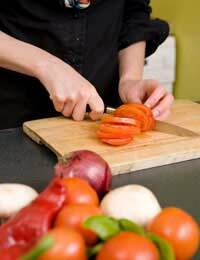 Clean surfaces and utensils in hot soapy water at each stage of cooking, and don’t sneeze or cough into food.